There's no denying that Everything Everything's sophomore effort 'Arc' has rapidly become one of the most talked about albums this year. Reaching number 5 in the UK Album Charts it has been a definitive sign that the band have matured and cultured their sound to cater for a much wider audience putting real music back in its rightful place. In the charts. Returning to Bristol's very own floating music venue, Thekla, on Saturday 9th February the laudably, forward thinking Manchester quartet had no problem in conjuring up a completely sold out show. Unfortunately due to a mishap with trains I was delayed in arriving which resulted in missing supporters Outfit bring their experimental blend of despondent indie-electronica to the West Country's finest. Thankfully I arrived just in time for the headline act. By this point the crowd was already warmed up, a distinct aura in the air as the beers flowed, all eagerly anticipating the band to take to the stage. And with needing no encouragement, the audience and band alike are both smiles ear to ear as the evenings proceedings are kicked off with the delectable single Kemosabe. Jonathan Higgs’s falsetto infused choir-like voice bounces around the packed out main room. Whilst the band could easily play the larger venues around Bristol (O2 Academy) their music feels a lot more at home here as the strong bass drum hits with a force across the 400 or so fans in this intimate setting. Moving ever so elegantly through Torso Of The Week & Feet For Hands it was nice to hear some of the band's older stuff amongst their set list. Admittedly catching on to their music a little later than most it wasn't until the build up to album number 2 that I became hooked on their sound so it was great to hear what I missed first time around played live. Tracks such as MY KZ, UR BF provided a brilliance in energy and skippy upbeat charm along with crowd pleaser Photoshop Handsome which soon administrated a sing along with those who could keep up with Higgs's fast paced vocals. Both tracks seeing guitarist Alex Robertshaw & bassist Jeremy Pritchard combining together with Higgs to form blissful 3 part harmonies. 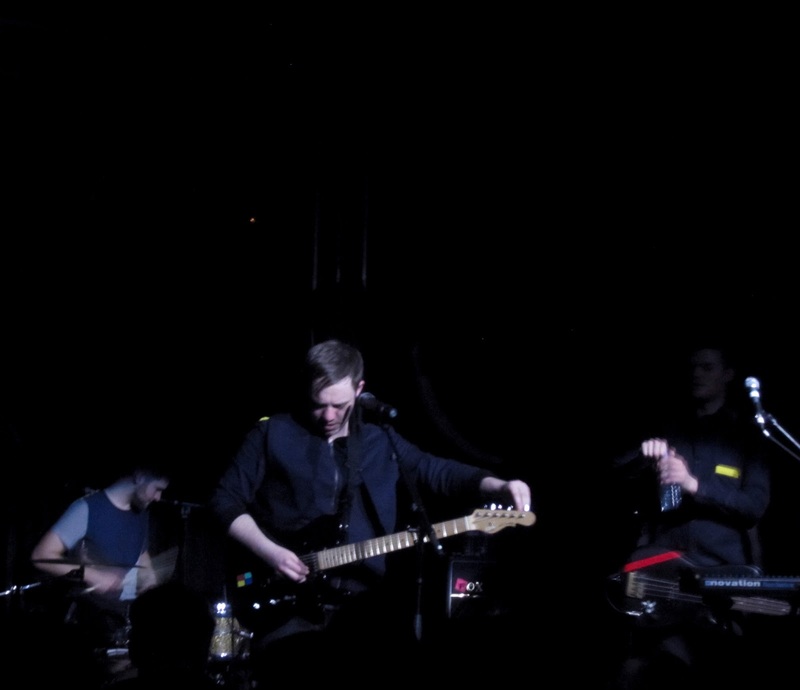 Their 75 minute set, being a delightful mix of both old and new was a beautiful representation of the band's talents. 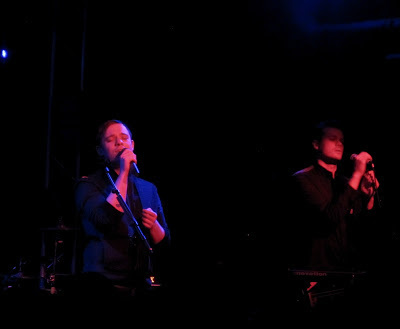 Whilst blasting out album favourites they felt equally comfortable on some of the more quiet numbers such as The Peaks. Higgs's distraught anguish slicing through the rising synths gripping the audience in all their warmth. It's hard not to fall victim to this overwhelming sincerity displaying a more vulnerable and heartfelt side. The same can be said for Leave The Engine Room as Michael Spearman's electrified percussion gently carries you over the softly sung chorus as the crowd joins in for "If all the boys say you did it, And all the girls say you did it". Whilst some of the crowd begin to mutter amongst themselves as we're are eased through The House Is Dust's quiet and taut musical landscape it becomes apparent their only here for the hits. Fortunately the majority attentively cling on to each word of Higg's disconsolate lyrics and it doesn't seem to unsettle the mood too much. Before I knew it Lead singer Jonathan Higgs was thanking the crowd profusely stating "this is our last song". As abruptly as they came on the band were back off stage whilst the room began to fill up with "encore" chants, an incisive reminder of their appreciation for tonight's show stopping performance. To much applause the band return and round up the evening with some of their newer material leaving on a high note with Radiant & Don't Try. Two tracks that appraise the four piece's energetic rhythmic appeal, it's clear to see the joys on their faces as they bring to a close a joyous performance that I'm sure many will remember for a long time. Covering an eclectic mix of tracks from both Arc & previous album Man Alive, the Mancunian band treated their fans to a fine slice of what their all about. Arc seemed the natural progression from their debut and its songs fitted equally at home live adding a touch of class and maturity to their forte. A brilliant show all round. The band continue their tour across the UK & Europe with tickets available for their European dates here. You can now also stream the new single 'Duet' above which will be available to buy on March 24th via RCA Victor.